Opera on iPhone – Is it really faster? Opera today announced that its mobile browser, Opera Mini, is available for the iPhone platform after spending quite a long while in App Store approval limbo. It is supposedly very fast, since it connects via a proxy server that compresses web pages first before downloading them on the browser. While I am not that a big fan of the desktop Opera browser, I am pretty enthusiastic about the iPhone version of the browser as it offers a non-Webkit based browser for iPhone. However, I do have my doubts as well. Many websites have an iPhone-optimized version of their website, which scales the website to fit comfortably on the iPhone screen and sport interfaces that are largely similar to the native iPhone applications. Examples include Facebook, Twitter and Google services just to name a few. However, these websites switch their interface based on the User Agent string ($_SERVER['HTTP_USER_AGENT'] in PHP) that is supplied by the browser. However, from the demo video, it seemed that Opera decided to use its own User Agent string instead of the using the one for Mobile Safari to trick webpages into displaying their iPhone optimized version. While this is not unexpected and unreasonable (very rarely do we see browsers using another browser’s User Agent string), it is a trade off for using the alternative browser, at least until those webpages design an iPhone optimized version for the Opera Mini. From the video, it seems that many webpages render in their full desktop version, which means a lot more zooming in and scrolling about, not to mention a longer loading time. Of course, you can access mobile versions of those websites, but those versions usually offer a subpar experience when compared to the iPhone version of the website. 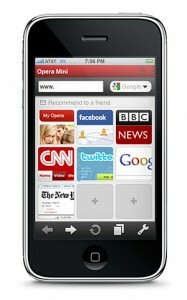 I can only hope that Opera has included developer features into the Opera Mini browser. Developer features often include an option to switch the User Agent string, which could potentially act as a workaround. (Hopes dashed – there are no developer features implemented so far. Most websites load an ugly mobile device optimized versions of their website.) Otherwise, until popular websites offer an iPhone optimized version of their website for the Opera Mini, it is unlikely that Opera Mini will take over Safari’s position on my iPhone dock.